What it is: Super Coffee is a delicious blend of coffee, protein and MCT Oil for all day energy. Our Family Story: It all started in our Youngest Brother's dorm room... As a collegiate student-athlete, he was tired and needed sustainable energy. But, his college campus only offered bottled coffees and energy drinks loaded with sugar. Refusing to settle for the norm, he created an upgraded, on-the-go SUPER beverage. He teamed up with his two older brothers to bring Super Coffee to the halls of your campus and the shelves of your local grocery store. The brothers were featured on ABC's Shark Tank on Feb, 11th 2018. Cheers to energy that inspires your best you! All Natural Sweetener Blend: Pure Monk Fruit and Organic Stevia: No sugar, rich in antioxidants, no glycemic index, no aftertaste. The unique low-calorie sweetness of monk fruit comes from naturally occurring antioxidants found in the fruit that have a delicious, sweet taste, without the calories of sugar. NEW FORMULA: 100% sugar free and naturally sweetened. Keto Diet approved. 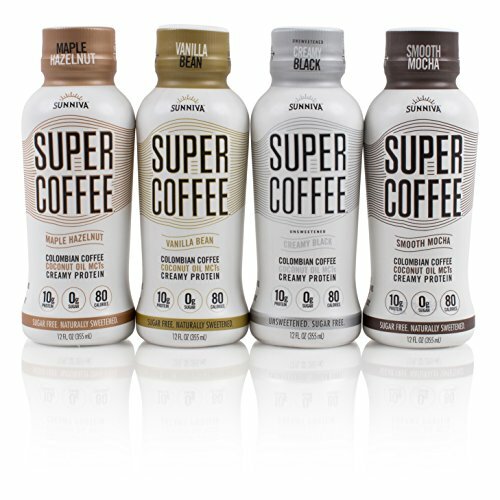 If you have any questions about this product by SUNNIVA SUPER COFFEE, contact us by completing and submitting the form below. If you are looking for a specif part number, please include it with your message.